The proposal follows the Trump administration's promise of "extreme vetting" of foreigners entering the U.S. to prevent terrorism. 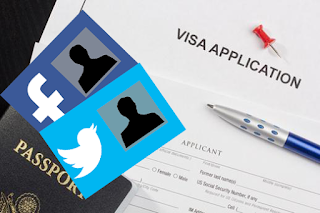 It is also an extension of the previous administration's instructions to collect social media identifiers when the State Department determines "that such information is required to confirm identity or conduct more rigorous national security vetting." Greater attention was placed on immigrants' social media use after it was revealed that one of the attackers of the 2015 San Bernardino terrorist attack had, under a pseudonym, advocated jihad in posts on a private social media account. Authorities did not find the account until after she was allowed entry into the U.S. Some expressed their concerns on the proposal's effects on freedom of speech and association and on privacy.